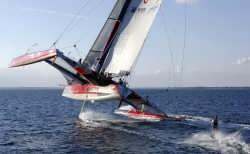 To me, those French trimarans represent the apex of sport sailing and self destruction for fun’s sake. I have to wonder why they are so popular in France, but just don’t seem to have the sav-wa faire the Volvo Ocean Race enjoys. The pink shoe was made for walking and that Puma is walking all over ORMA. 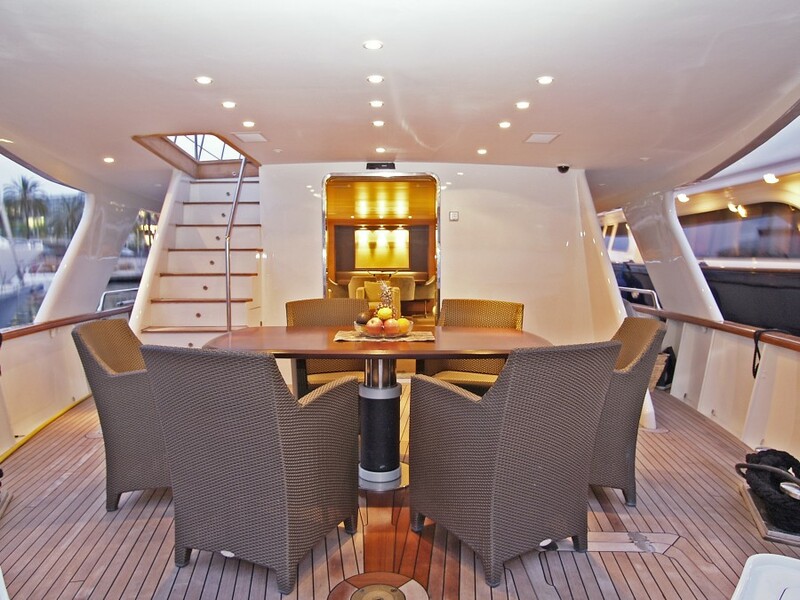 So why is the multihull fleet shrinking? Is it because the boats cost too much for the sponsors to pay for? 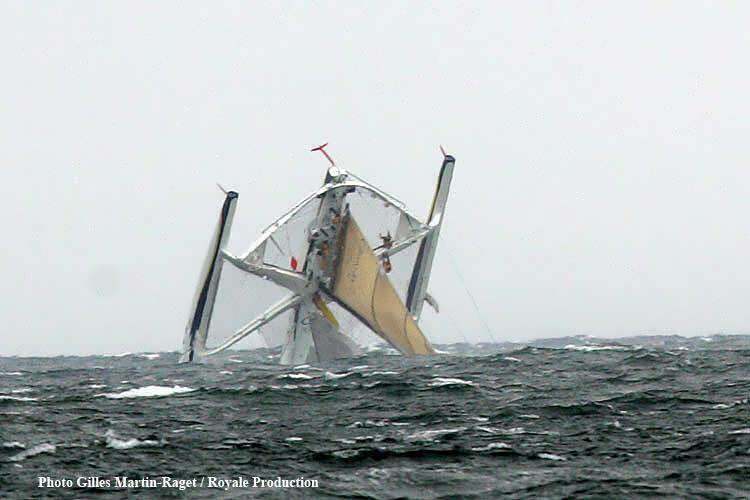 Well, I guess that depends…..
One of my all time favorite sailing pics has to be the Gitana tri pitchpoling; the top of the mast in the water – but the boat hasn’t turned turtle yet. 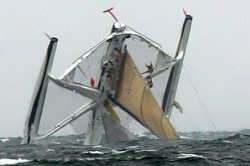 I know that moment well: the tip of the mast underwater, and the savage feeling when the gravity of the moment sinks in. 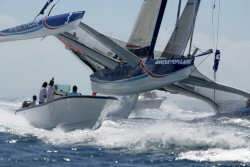 Every sailor knows that moment and every sailor that is lucky enough to laugh about it later has a good story to tell when the conversation at the Yacht Club bar starts to grow dull. 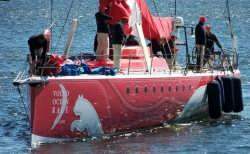 ORMA’s slow slip into oblivion hasn’t stopped people from trying to bring the trimaran into mainstream racing and day cruising. The Tremolino is now back in production, along with an impressive updated brother boat the TGull 2300. I have seen one of those beauties up close, and they are pretty cool. The Astus 14.1 looks like a great little ride! I really like the 20 foot version too. I think a fleet of smaller tris would be a blast to sail on the club level. 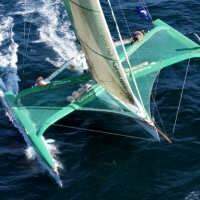 The French are just taking trimaran racing to a different level and I would like to take this opportunity to thank them for ORMA and the bikini! All that work and effort was worth it, just for that one shot of the pitch poled tri and the yearly sports illustrated swimsuit issue, but I still don’t really get it! All the elements of a great action sequence exist in tri racing; there is danger, ocean fury, speed and French accents. So why is ORMA shrinking? I think it is has something to do with the fact that a trimaran painted to look like a big pink shoe would just look silly, but a monohull painted to look like a big pink shoe changes the way we think about Athlete’s foot! 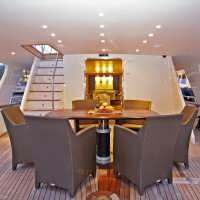 Check out the Fast Multihulls section of the BYM Gallery.